Red—the color of strength and love. It's my favorite color to wear because it instantly makes me feel bold and powerful, while also being romantic and flirty. 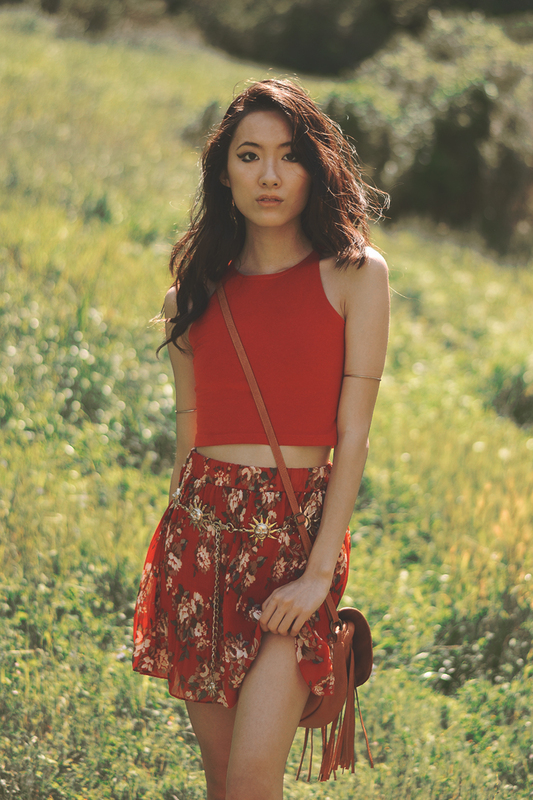 It was well overdue for another red outfit so when my wonderful friend Kimsa came back for spring break, she helped me shoot this look in the fields! Read on for full outfit details and why each piece is sustainable! Surrounded by the natural beauty and positive energy of the forest, this shoot was truly a retreat for the mind and spirit. I love doing outfit shoots because they combine my love for styling and also for exploring new locations. One of my favorite things is seeing an outfit and setting paired in such a harmonious way that they create something much greater altogether! Read on for the full sustainability breakdown of each item in this outfit and also details for a sneakers giveaway with Inkkas! This look was so much fun to create because this bralette is actually custom designed by me! I got to pick out all the colors, materials, and trimmings so I ended up with a finished piece that is entirely me and definitely not something I'd easily be able to find everyday in store! Read on to find out where you can custom design your own lingerie and loungewear, and for the sustainability breakdown for every piece in this outfit! I can't help feeling like a mermaid out of water in this beautiful fishnet dress by Pima Doll which we shot in the cactus garden! This dress is truly a work of art and the best part is how sustainable and ethically-made this piece is! Read on for full outfit details and also a $75 gift card giveaway to Pima Doll! Dressed in earthy green tones, my natural inclination towards monochrome drew me to shoot these outfit photos in a forest setting! My crossbody bag, lace up boots, and Brave charm bracelet, all made me feel ready for exploration and adventure! Read on for full outfit details and sustainability points for each item in this outfit! Read more for full outfit details and a sustainability breakdown of each item! Desert goddess with a little bit of Star Wars inspiration—this is a set of photos I'm beyond happy with! The outfit and location came together perfectly to create the warm and mythical mood I had envisioned. Keep reading for full outfit details and why each item is a sustainable choice! I have always had a weakness for anything with a moon motif, so naturally, when I saw this top had 24 of them, it was love at first sight! 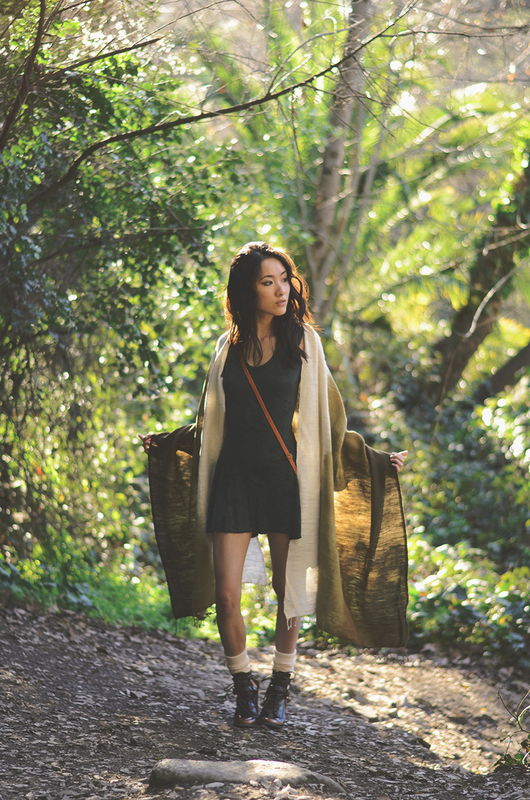 This is an earthy look with an edge, and it's one of the comfiest outfits I own because it's made with organic cotton! Scroll down for full outfit details and also a $75 giftcard giveaway to Synergy Organic Clothing!